How far is the Capitol? The capitol is about 3 blocks from our location, about a 5-7 minute walk. What is the closest Metro (subway) stop? The closest stop is Union Station, two blocks away. It is about a five minute walk. Is there parking available? No, we do not offer parking for our residents. Due to the rapidly changing locations and pricing of nearby garages and lots, we do not have recommendations of where to pay to park nearby. However, you can obtain a reciprocity parking permit through DC: http://dmv.dc.gov/book/vehicle-fees/parking-permit-reciprocity (the temporary DC resident is the best option for your stay). Is there a nearby grocery store? Yes, there are several nearby options within a short walk. Upon move in, you will receive a packet of information, including maps and directions to nearby amenities you may need during the course of your stay. Is there a kitchen? Each unit is quipped with a full kitchen, including an oven, stovetop, dishwasher, refrigerator, sink, microwave, toaster and a coffee maker. Can I bring a crockpot? Yes, electric countertop cooking devices such as a crock pot, electric skillet, or rice cookers are permitted. Is it a suite style bathroom? There is one bathroom per bedroom per unit. Can I live in a single? We do not offer any singles – all of our apartments are shared one or two bedroom units housing three or four residents. The average age of our residents is 23; however, we have residents ranging into their late 20s. Our building is focused on building community and providing networking opportunities among conservative interns. Given this goal, and the overall satisfaction of past residents, we continue to structure the units with multiple occupants. What size linens should I bring? What size are the beds? The beds are designed to fit either Twin or Twin XL sheet sizes, but we recommend XL to be certain they will fit well. How much closet space is available? Each bedroom has one closet with 6+ feet of hanging space in addition to under bed dressers. What else is provided in my room? View our amenities checklist here. Are there a washer and dryer available in the building? 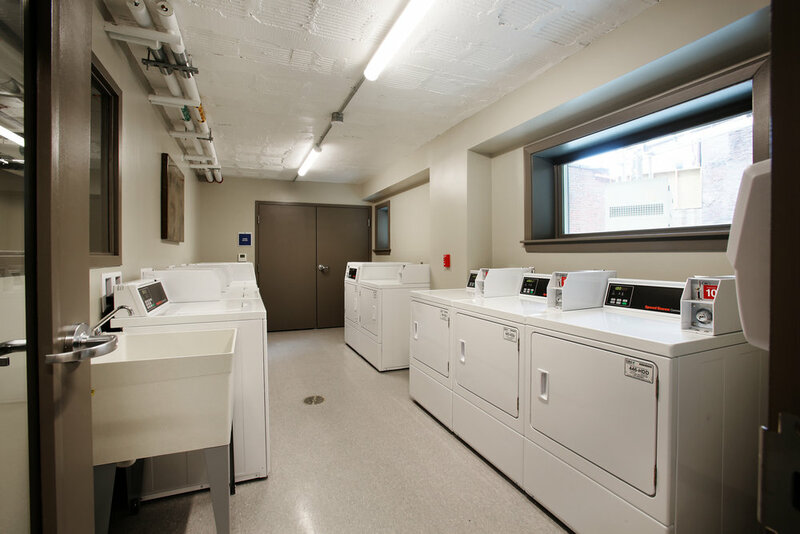 Yes, there are four washers and four dryers located on site. They are large capacity units and do not require HE detergent, although HE detergents work fine. Is there a gym available to interns? Yes, there is a gym located in the basement level available for resident use from 6am-10pm 7 days per week. What equipment is in the gym? The fitness center facility features multiple 2 treadmills, 1 elliptical machine and free weights. Is there free Wi-Fi? Yes, wireless internet is included in your fee. We offer a high speed internet connection via Wi-Fi throughout our property. Internet access is also available in-room via WAP and Ethernet ports, if preferred. Can I use my own airport, router or WAP? No, due to the structure of our WiFi, using one of these devices in our building will impair the wireless internet access for the other residents. Do we need to bring or buy cleaning supplies? There is a cleaning supply closet that interns have access to during the duration of their stay in the building which provides basic cleaning items including a mop, vacuum, and generic cleaning spray. You may wish to bring items such as a Swiffer, Clorox wipes, etc. You are also responsible for your own linens, towels, and paper products such as paper towels and toilet paper. Can I move in early? Due to the nature of our program, we are unable to accommodate any move ins prior to our pre-scheduled check in date unless application specifically stated otherwise. Can my school or university pay directly for housing or does the payment have to come from me, the resident? Yes, we can accept checks on your behalf from either your school, scholarship, or someone other than you. If the check is from a third party, please ensure your name is included in the memo line. Can I have overnight guests? Overnight guests are permitted, up to two guest per resident for no more than three nights per visit. Guests are approved by the RAs and require the signed consent of all roommates. Approval for the guest should be requested prior to travel plans being arranged. What can I expect check in day to look like? Check in takes place from 10-4; you arrive during that time, complete additional paperwork required by DC, are welcomed by our team of RAs who take you to your room to allow you to get settled. Later that evening, we have our orientation, which includes a formal tour of the building, introductions among the residents, and is followed by dinner and fellowship. Where can I unload on check in day? There will be parking spaces available and marked by cones in front of our building. Once you unload, our team of RAs can direct you to a parking lot where your car can stay for the rest of the day. Specific details regarding move in will be emailed to all incoming residents the week prior to move in. How does the mailing system work? Our mail functions as a business, so it is only Monday-Friday delivery and often delayed a day since it is sorted through a processing facility, not delivered directly like residential mail. Therefore, the package will be received, signed for, and stored in a locked closet. You will be given a key to your mailbox upon arrival when room keys are distributed to check letter mail. Since we do not have weekend delivery, we recommend aiming for your boxes or other urgent mail to arrive by the previous Wednesday or Thursday to ensure you will have them prior to the weekend. However, some restrictions do apply when shipping mail. You may not ship boxes prior to the month you move in. i.e. if your internship starts January 13th, you may start shipping boxes at the beginning of January at the earliest.